I'm delighted to welcome Maggy Woodley as a guest to The Book Chook today. Maggy Woodley is a Mum of Two living in the UK. When she had her children, she decided to stay at home with them. Maggy started her craft blog Red Ted Art in order to share her craft ideas for both children and adults – hoping to inspire others to “have a go” and “have fun” with their children or to discover new crafts and ideas for themselves. Crafting is something for all age groups and everyone can have a go! Her weekly How Tos are aimed to be “easy to follow” and inspirational for both adults and teens, whilst her kids craft aim to please toddlers – 10yrs olds! Hello! I'm Maggy and I'm visiting from over at Red Ted Art, where I regularly craft with my 3 year old son (Red Ted) and my 1 year old daughter (Pip Sqeauk). We love to get crafty and share our ideas and encourage others to have a go. Today, we're very excited to Guest Post for The Book Chook! We love books in our house, it is “the one thing” I truly indulge my children in. What we love even more, is to combine a good story with a good craft! We often take inspiration from the wonderful books around us. This makes for very successful crafting: children sometimes find it hard to “imagine a finished item” and if they know they are making something from a story they love it can be easier for them to find some motivation to start something they don’t exactly know how it will finish. I know it works, as my son (3) now regularly brings stories to me and ask me if we can make the characters within it.. he can’t get enough of crafting and I sometimes even get a 6am wake up call as he wants to finish something we started the day before. I started crafting with my son when he was 2yrs old. 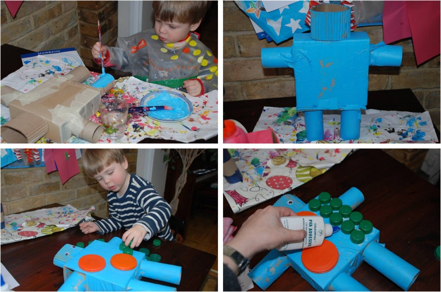 We made these robots when he was 3, however I believe this craft is great for children up to around 8 years of age! We read a British book called Harry and The Robots, by Ian Whybrow. It's a lovely book about Harry, a little boy who makes some robots for his sick grandmother. 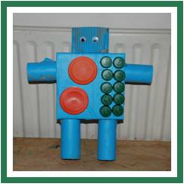 When Harry's toy robot breaks, his Granny sends the toy off to be mended and suggest they make some of their own whilst the robot is away. That night however Granny falls ill and is taken to hospital. Harry decides to make his own Robots and then sneaks them into hospital to help Granny get better! He makes LOADS in all shapes and sizes. Red Ted (3) thoroughly enjoyed the book, loved all the little robots and as mentioned above ran off and wanted to make his own. We made two robots on consecutive days as Red Ted enjoyed the process so much. I will tell you what we used to make them, but don’t worry if you don’t have the same materials – let your imagination and your materials take you somewhere different! You can also use poster paint and mix it with a little PVA glue, this will stop it crumbling. 1) I made some holes for the arms and legs and stuck the bubble bottles in. Added a little glue to keep them in place – now the buttons are added at the very end, and we found with both robots, that they made the robots topple – i.e. the leg position needs to be different OR you can fill the legs or the box with rice/ stones or something to weigh it down? Just a thought for you to learn from my “mistakes”. 2) I asked Red Ted what colour he wanted and he shouted pink. So pink it was. I think it is a rather fabulous robot colour! 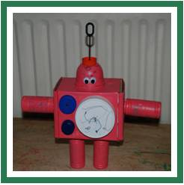 3) Red Ted then painted the whole robot pink. I helped him by pointing out any unpainted areas. 5) Stick on Googly eyes, buttons and antenna – I found lots of PVA worked fine, save for the antenna, where I later used superglue (personal note: don’t EVER use superglue with kids around, I think it just too tempting). Red Ted also decided to draw on the buttons a little. I think it is cute! For the blue one, we stuck the loo rolls on with lots of masking tape – it has to masking tape, as paint won’t stay on “packing tape”. We used rather a lot, as we also “closed the sides” of the box with tape. For the head, we just rolled up the corrugated card and taped in place. The rest is as before. Note – this one really does topple as it has SOOOO many buttons, but I think either some weights or some “feet” could resolve the problem. Also, that last photo shows me adding lots of extra glue AROUND the buttons to help keep them on. These robots, sadly are not 1-yrs-old safe!!! But are fine for almost 3 year olds! Play some more. And we did!! YAY! I hope you enjoyed this craft and that our book/ craft approach inspires you to do the same. It really is a great way to come up with new ideas. Alternatively, do stop by at Red Ted Art and check out our Kids Get Crafty section – you'll always find a book review and a fun craft!